Bal Harbour is a small town in Miami Dade County that is located on the barrier island of Miami Beach. Collins Ave is the main highway that contains all of the main attractions and entertainment facilities along with being parallel to the beach. The whole town is a total area of 0.6 square miles, which gives residents a homey, small town feel. 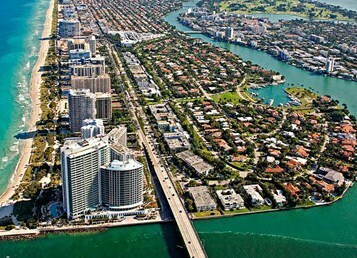 Bal Harbour is an affluent community that houses some of the most lavish and elegant real estate in the county. Bal Harbour hotels contain some of the most luxurious and extravagant amenities to make the guests stay relaxing and enjoyable. It is home to some of the best shopping available such as the Bal Harbour shops that is anchored by Neiman Marcus and Saks Fifth. Bal Harbour is also only minutes from Aventura, which contains the Aventura Mall, one of the biggest malls in the country. Shopping isn’t the only activity available; there are many parks and recreational activities located in Bal Harbour, as well as beach activities. Story time at the park and outdoor movies are only some of the reoccurring activities throughout the year perfect for both families and couples. Exquisite dining and entertainment in Bal Harbour and South Beach which is only minutes away. Bal Harbour is the perfect place to call home. For those looking for a vacation home, Bal Harbour has the prime location near all of the major cities without being in the center of the busy city. Fort Lauderdale is located to the North and Miami to the South so residents can enjoy everything that both have to offer. Bal Harbour is close to both major airports and all major highways to take you wherever you need to go. For residents that plan to make Bal Harbour their year round destination, the schools are excellent and the weather is beautiful year round. During the summer the lows are around 75 degrees Fahrenheit and get up to the 90s and in the winter the lows are only about 60 degrees and raise to about 75degrees. With everything that Bal Harbour is full of opulence and luxury, you may never want to leave.